Amazing Patented Water Level Sensor Measures Liquid with a Wire. "The AquaPlumb has been the perfect solution for my application. My residential water supply relies on rain water catchment so I have to keep a close eye on the levels to make sure I don't get too low. Even with dirty water (from dust & tree debris), seasonal temperature extremes and operating in a 100% humid environment, the AquaPlumb has held up and always gave me accurate and reliable measurements. This is a huge improvement over my old method of having to lift up an 80lb concrete lid to see how much water was in the tank." Output Voltage is proportional to liquid level. Can Measure large changes in water level. Compact size, and easy to mount. Works with many different type of fluids. Compatible with Arduino and most dataloggers. Sensor for Internet of Things. You will amaze your friends, when they see that you can monitor water level with a strand of common wire. Accurately measure the level of any fluid, including water, salt water, and oils. The rugged weather-proof control box, will give you years of trouble free operation. Mount the box to any surface in minutes, using the mounting holes in the wings on the side of the box. The sensor wire is made of tough PVC plastic, and is resistant to corrosion over time. It can be trimmed to any length to match the depth of your water tank or reservoir, from 10 cm to 3 meters deep. It's easy to interface the Aquaplumb to other equipment, because it continuously outputs a voltage directly related to the percentage of the cable that is submerged. The output range is 0V to 3V, where 0V is the minimum water level, and 3V is the maximum water level. Any device which can read a voltage, can read the Aquaplumb water level sensor. This includes devices as simple as volt meters, to more complex data loggers. We provide modular building blocks that you need to create your soil moisture application. With these building blocks, you can create systems that will monitor soil moisture, and automatically control watering. We recommend using our VegeHub WiFi garden sensor hub to read the AquaPlumb, because you can view water level data on your computer or phone web browser, remotely from any where in the world. We've partnered with the sensor cloud site - VegeCloud.com which will graph, store, and manage your water level sensor data. Your batteries can last for years, because the AquaPlumb is crafted to be lower power. For lowest power operation, only power the sensor right before you take a reading, and then power it down, until the next reading. Our other data logger products do this for you automatically. The normal operating mode power is only 1.2 mA, so this system can be loop powered in 4-20mA current loops used by PLAs. During calibration mode the sensor uses up to 20mA, but this is only used during calibration for the initial setup. The AquaPlumb water level sensor can be adapted to any tank depth with a simple calibration procedure, which is explained below. For your convenience, the end of the cable has a bob-clamp, which can be mounted to the side of a reservoir, to a small weight, or to a stick, to keep the wire fixed. 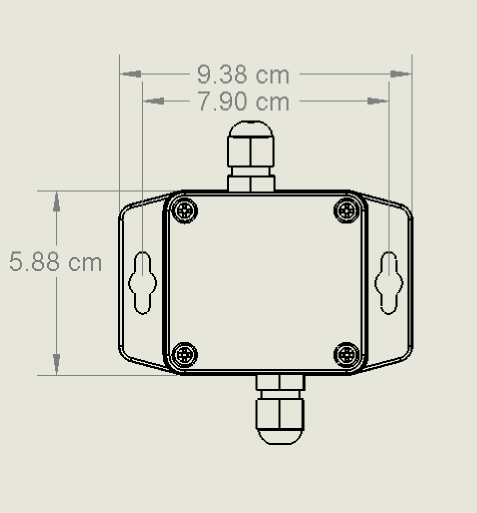 When ordering the AquaPlumb sensors, select the length of the power cable in standard 2 meter, 5 meter or 10 meter lengths. The sensing cable comes in the standard lengths of 1 meter and 3 meter lengths. See the ordering table below. If you aren't amazed and delighted by your new water level sensor, return it for a refund within 30 days. AquaPlumb® Kit Includes:	sensor wire, sensor wire clamp, controller board, water tight box, and power cable. Extension Cable for AquaPlumb Sensors. Output>Output 0 to 3V linear with fluid level. What is the	resolution of thewater level sensor? The output resolution is 3 mV, which corresponds to a length resolution of 0.001 over the calibrated length. For example,if the calibrated length of the sensor wire is 1 meter, the resolution is 1 mm, and if the calibrate length is 3 meters, the resolution is 3 mm. Will the water level sensor measure liquids other than water? Absolutely. In the video you see it working with olive oil - which is a non-polar liquid. What happens to the output of thewater level sensor, if the water is turbulent? You	can low pass filter, or a moving average digital filter to smooth out the signal, or merely connect a capacitor to output of the sensor and to the ground of the sensor. Can the water level sensor wire be cut shorter? Yes, but one end must be sealed. You can also just calibrate it for shorter lengths - no is cutting needed. Can the the water level sensor be used with flammable liquids? No. Do not use it with flammable liquids. If different parts of the wire are submerged, rather than just one end what is the response? The response is the total submerged length divided by the calibrated length times 3V. For example: if the sensor wire is calibrated to 1 meter, and the first quarter and last quarter of the sensor are submersed, then the sensor will output 1.5V. If the water moves downward quickly such that the sensor wire still has a film of moisture on it from the previous water level, will this affect the reading? If the sensor wire is slightly wet, above the current water level, yes, it will affect the reading slightly. What comes with the AquaPlumb Kit? It includes: a liquid sensor wire, controller board, power cable, water tight box, sensor wire end clamp. If power is removed	from the AquaPlumb are the calibration settings saved? The best way to get started is to purchase a few low cost water level sensor probes from our webstore and try them out in your application. The	AquaPlumb has two calibration buttons. The sensor wire can be calibrated for different liquids, and for different maximum lengths. For example, if you have a 1 meter sensor wire, it can be calibrated so that it's maximum level is at 1 meter, or a fraction of a meter. If the sensor is calibrated to .5 meters this means that it puts out 3V at .5 meters. The sensor should be re-calibrated when it is moved, or when different liquids are used. To calibrate it use these steps. Open the case, by removing the 4 corner	screws. Remove the sensor wire and dry it off so that it is	completely dry. Press the upper right button which says "Calibrate Dry". After 2 seconds of pressing down the button, a red LED will turn on. Release the button,	and it will blink several times, and turn off. Do not touch the	sensor wire while you are calibrating it, as this will affect the accuracy, since it will detect the water in your hands. Insert the sensor wire into the liquid to the maximum length that you desire. This can be any depth up to the full length of the wire. Press the bottom right button which says "Calibrate Wet". After 2 seconds of pressing down the button, a red LED will turn on. Release the button, and it will blink several times, and turn off. The sensor element is now fully calibrated. If your sensor has a relay, to calibrate the relay threshold, insert the sensor wire into the liquid, at the point where you want the relay to turn on. Then press both buttons for two seconds. Both LEDs should turn on, when you release the buttons, the LEDs will blink several times. The relay is now calibrated. To change the polarity of the relay, either insert or remove the polarity jumper on J1. Both LEDs are flashing after calibration. This means that there was a mistake durring calibration: that the dry or low water level calibration point, is higher than the wet, or high water level point. This can occur if you've pressed the wrong button, or didn't calibrate in the correct sequence. Just go through the calibration routine again, and this issue should go away. You should also make sure that all of the wires are secure in their respective terminal blocks. A button was pressed, but LED wont light up. The button must be pressed down for 3-4 seconds to light the LED, and begin calibration. A quick press of the button, will not work.